Authors are members of The Synaptic Leap, where the original research was coordinated and first disclosed. The preparation of enantiopure praziquantel is described through the classical resolution of a hydrolysis product, praziquanamine. The protocol is experimentally simple, and involves no chromatography. The method was found and validated by an unusual research mechanism - open science - where the details of the collaboration (involving academic and industrial partners) and all research data were available on the web as they were acquired, and anyone could take part. With increasing use comes an increase in the risk of the development of resistance or tolerance by the parasite. Such resistance was famously developed via an artificial selection experiment in the laboratory,(Fallon 1994) and examples of resistance have already been noted in the field. (Liang 2010, Melman 2009, Doenhoff 2002, Liang 2001) Reliance on a single drug for intensive mass treatment is dangerous. While there have been attempts to find bioactive PZQ analogs,(Dong 2010, Laurent 2008, Ronketti 2007) as well as the discovery of new compounds for the treatment of schistosomiasis based on different modes of action,(ref) in the short term it is sensible to continue to use PZQ in a way that maximises its life as a useful drug. PZQ is synthesised and administered as a racemate. The (-)-enantiomer is the eutomer(Xiao 1989, Wu 1991) and has the (R) configuration. (Andrews 1983, citing "R. Grosser, Bayer AG, internal report (1982)"; Meyer 2009) Administration of the pure eutomer resulted in fewer side effects than the racemate. (Wu 1991) The inactive (+)-enantiomer is associated with side effects and is also primarily responsible for the extremely bitter taste of the pill;(Meyer 2009) compliance in taking PZQ in the field is already a challenge. (Parker 2008) (ref to bitterness impacting this?) The typical dose per treatment (600 mg)(correct?) is large. To postpone the development of resistance it would be advantageous to increase the dose of the drug administered, while decreasing the pill size, reducing side effects and removing the bitter taste. All this could be accomplished were the drug to be made available as a single enantiomer. For these reasons investigations into the viability of a process-scale route to enantiopure PZQ were included in the WHO/TDR business plan for the coming years. [TDR 2007] Availability of the separate enantiomers would also be a valuable tool for the elucidation of the mechanism of action of the drug, still unknown after more than 30 years of use. There are typically four methods available for the conversion of a racemic synthesis to one that generates the same molecule as a single enantiomer: 1) Enantioselective synthesis, 2) Chromatographic separation, 3) Stereoablation and 4) Resolution. To date there have been no reports of any such strategies that have promise for the large-scale generation of enantiopure PZQ. [Ref to others] The approaches are all being investigated by the scientific community on an online collaborative open science portal known as The Synaptic Leap. This article describes the recent solution to the resolution of PZQ identified using this open science mechanism. The protocol developed permits the convenient generation of PZQ enantiomers on a gram scale. An attractive approach to the resolution of PZQ is to employ the commercially-available racemic material which is already available on a large scale for a low price. PZQ contains only amide functional groups that are not amenable to resolution, so the drug needs to be converted to a species that is amenable to cocrystallization, and the obvious solution is to cleave the exocyclic amide bond to give a secondary amine (2, PZQamine). A similar strategy was reported in one of the original patents in this area,(Pohlke 1976) albeit on an aromatic (benzoyl rather than cyclohexanoyl) analog of PZQ; the hydrolysis of this same analog was also reported more recently in a paper concerning the synthesis of other analogs of PZQ. It was found that the resolution of PZQamine could be effected with quinic acid. However, no information was given concerning the yield of material isolated, nor its enantiopurity. Further, use of naturally-occurring D-(-)-quinic acid gave crystals of the quinic acid salt containing the undesired enantiomer of PZQamine, necessitating the isolation of the desired enantiomer of PZQamine from the mother liquor, typically an undesirable approach. This is not a trivial problem to rectify since L-(+)-quinic acid is not available in quantity. The hydrolysis of PZQ itself has been reported for purposes not related to the resolution of PZQ. (Mitsui 2001, Dong 2010) A recent report on the attempted resolution of PZQamine (synthesized de novo, not from the hydrolysis of PZQ) reported that common chiral acids (tartaric acid, camphorsulfonic acid, mandelenic acid and Mosher's acid) under a variety of conditions failed to result in resolution. (Laurent 2008) Ultimately PZQamine enantiomers were obtained by the covalent attachment of Mosher's acid, chromatographic separation, and finally cleavage of the exocyclic amide bond under harsh conditions. The hydrolysis of PZQ to give PZQamine has been reported to occur in low yield (1 N HCl, reflux, 3 hours, 27% yield)(Mitsui 2001) using conditions which gave efficient cleavage of a PZQ analog where cyclohexanoyl was replaced with benzoyl. (patent, Frehel) More recently the hydrolysis was reported to occur in 2 N HCl solution under reflux for 20 hours in 80% yield. (Dong 2010) In our hands cleavage in a mixture of 1 N HCl solution in ethanol (4:1) under reflux for 26 hours gave PZQamine in 92% yield. The amine could conveniently be isolated by recrystallization from toluene on a multi-gram scale. With a suitable analytical method in hand a number of different resolution agents and conditions were screened. Given that many people may not have access to the column necessary for the determination of the enantiomeric excess of PZQamine, we confirmed that, in ethanol at a convenient concentration, the optical rotation and enantiomeric composition of PZQamine are linearly related (Figure X). Thus purification of PZQamine to constant melting point and measurement of the optical rotation under these conditions will give an adequate measure of the enantiomeric excess achieved in the resolution without the need for chromatographic analysis. In fact a linear relationship is also seen for PZQ itself under related conditions, as well as a linear relationship between concentration and observed optical rotation up to 1 g per mL (correct concentration?) ([Figure X]). 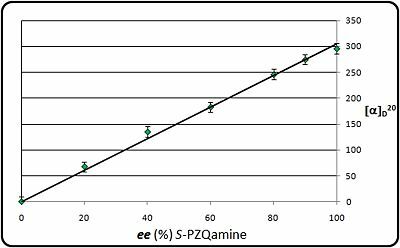 The conversion of enantiopure PZQamine to PZQ may be achieved by X. There is no loss of optical purity in this step. Comments on Chemistry: The resolution of PZQamine was reported in one of the original PZQ patents, but there was little experimental detail and the method had a number of shortcomings (expand on this). Since then there have been no further reports of the successful preparation of enantiopure PZQ using this approach, despite attempts along these lines. Resolution is attractive as a means to prepare enantiopure PZQ since costs can be kept low, and operationally the methods are typically simple, requiring crystallisations rather than elaborate chromatographic separations or stereocontrolled syntheses. It is thus the hope that the present method will find use outside chemical laboratories. Hydrolysis of PZQ (see: http://www.thesynapticleap.org/node/296) (rac)-PZQ (20.0 g, 64.0 mmol) was dissolved in a mixture of EtOH (150 mL) and 1 N HCl (600 mL) and heated at reflux for 26 h. The solution was cooled to room temperature and washed three times with ethyl acetate (10 mL). Then the ice-cooled solution was adjusted to pH 12 with 5 N NaOH and extracted four times with DCM (30 mL). The combined organic layers were washed with basified brine solution (pH ~12), dried over sodium sulfate and concentrated under reduced pressure. The residual yellow solid (12.4 g) was recrystallized from toluene and a further batch of analytically identical crystals were obtained from the mother liquor after concentration and recrystallization. PZQamine was thus obtained as a pale yellow solid (11.9 g, 58.8 mmol, 92% yield). (-)-Dibenzoyl-L-tartaric acid * 2 isopropanol (see: http://www.ourexperiment.org/racres_pzq/1279) A mixture L-(+)-tartaric acid (27.0 g, 180 mmol) and benzoyl chloride (73 mL, 630 mmol) was heated to 130°C for 4 h. When a pale yellow solid was formed the mixture was cooled to room temperature, washed with cold diethyl ether and recrystallized from toluene (400 mL) obtaining 48.3 g (141 mmol, 79%) (-)-dibenzoyl-L-tartaric acid anydride as a colorless crystalline solid. The anhydride (48.3 g, 141 mmol) was dissolved in a mixture of acetone (200 mL) and water (20 mL) and heated to reflux for 2 h. Water (200 mL) was added and aceton was removed under reduced pressure. After further addition of water (200 mL) the mixture was heated to reflux and cooled to 0°C for 30 min. The precipitate was filtered off and dried by lyophilization. Alternatively, the solid can be dissolved in ethyl acetate, dried over sodium sulfate and concentrated under reduced pressure obtaining a colorless oil. The residue (~50 g) was recrystallized from isopropanol/hexane (500 mL, 1:1) and the mother liquor was concentrated and recrystallized two times from isopropanol/hexane (400 mL, 1:2 and 50 mL, 1:2) obtaining 58.9 g (123 mmol, 68%) (-)-Dibenzoyl-L-tartaric acid * 2 isopropanol as colorless spicular crystals. m.p. 99-102°C. 1H NMR (DMSO-d6, 200 MHz): δ = 1.03 (d, J=6 Hz, 12H), 3.78 (sep, J=6 Hz, 2H), 5.88 (s, 2H), 7.57-7.64 (m, 4H), 7.70-7.74 (m, 2H), 8.00-8.04 (m, 4H), 14.00 (bs, 2H). 13C NMR (DMSO-d6, 50.3 MHz): δ = 25.5 (4C), 62.2 (2C), 71.6 (2C), 128.6 (2C), 129.1 (4C), 129.5 (4C), 134.2 (2C), 164.8 (2C), 167.3 (2C). IR (neat): nu = 3465 cm-1, 2975, 1730, 1237, 1098, 938, 706. MS (ESI (-)) m/z (%): 357 (100) [M-H]-. HRMS (ESI (-)) Calcd. for [C18H13O8]-: 357.0616, found: 357.0616. HRMS (ESI (+)) Calcd. for [C18H14O8+Na]+: 381.0581, found: 381.0579. C24H30O10 (478.5 g/mol): calc. C 60.24%, H 6.32%; found: C 60.27%, H 6.33%. [α]D20 = -85.0° (c=1, EtOH). (+)-Di-p-anisoly-D-tartaric acid (see: http://www.ourexperiment.org/racres_pzq/1185) A mixture of p-methoxybenzoic acid (33.6 g, 253 mmol) and thionyl chloride (82 g, 691 mmol 50 mL, 2.72 eq.) was stirred for 1 h at room temperature and heated to reflux for a further 3 h. Thionyl chloride was distilled off and remain was concentrated under reduced pressure. To p-methoxy benzoyl chloride (2R,3R)-(+)-tartaric acid (12.5 g, 83.0 mmol) was added and heated to 140°C for 1 h till a pale yellow solid was formed. Then the mixture was heated to 160°C for 1 h. When the mixture was cooled to 100°C toluene (100 mL) was added and a further portion of toluene (50 mL) was added when it was cooled to room temperature. The colorless solid was filtered off, rinsed with a small amount of cold toluene and dried under vacuum. The (+)-Di-p-anisoly-D-tartaric acid anhydride was dissolved in a mixture acetone (150 mL) and water (10 mL) and heated to reflux for 2 h. After addition of water (100 mL) acetone was evaporated and another time water (100 mL) was added. The colorless precipitate was filtered off and dried. To remove remaining p-methoxybenzoic acid the product was heated to reflux with toluene (100 mL) for 15 min, the precipitate was filtered off while the mixture was hot and washed with hot tolunene. The procedure was repeated for four times yielded in 19.9 g (47.6 mmol, 57%) of (+)-Di-p-anisoly-D-tartaric acid as a colorless solid. m.p. 186-188.5°C (lit: 186°C (P. Rabe, Justus Liebigs Annalen der Chemie)), 1H NMR (DMSO-d6, 200 MHz) : δ = 3.50 (bs, 2H), 3.86 (s, 6H), 5.80 (s, 2H), 7.13 (d, J=8 Hz, 4H), 7.97 (d, J=8 Hz, 4H). 13C NMR (DMSO-d6, 50.3 MHz) : δ = 55.7 (2C), 71.2 (2C), 114.4 (4C), 120.7 (2C),131.6 (4C), 163.8 (2C), 164.3 (2C),167.4 (2C). IR (neat): nu = 2943 cm-1, 1720, 1662, 1601, 1243, 1170, 1103, 1012, 847, 762, 691. MS (ESI (+)) m/z (%): 875 (35) [2M+K]+, 859 (85) [2M+Na]+, 441 (53) [M+Na]+, 435 (85), 329 (100). HRMS (ESI (+)) Calcd. for [C20H18O10+Na]+: 441.07922, found: 441.0790. [alpha]D20 = +163° (c=1, EtOH), (lit: [alpha]D20 = +167° (c=1, MeOH) (P. Rabe, Justus Liebigs Annalen der Chemie); 163° (c=1, EtOH) (TCI America, Chemical Supplier for (+)-Di-p-anisoyl-D-tartaric Acid)). C20H18O10 (418.4). Merck patent gives m.p. of quinic acid salt as 196°C. Gives (-)-PZQamine m.p. 120°C and alpha of -306°. No indication of enantiopurity, nor solvent/concentration employed for the measurement of alpha. (Laurent 2008) gives Specific rotations of (R)-PZQamine and (S)-PZQamine as [α]D = –152 (c = 4.10–3, CH2Cl2) and [α]D = +146 (c = 5.10–3, CH2Cl2) for enantiomeric excesses higher than 95 and 91%, respectively. Include method for determining ee of PZQamine without HPLC. The diastereomeric salt was recrystallized from a mixture of isopropanol (180 mL) and water (90 mL) and the crystalline precipitate was filtered off after the mixture was kept for 12 h at 5°C (after 2 hours the crystallization process is almost completed) yielded in 10.2 g (18.3 mmol, 85%, 37% over-all) colorless spicular crystals. m.p. 147.3 - 148.5°C. Liberation of the diasteromeric salt. The salt was suspended in water (100 mL) and adjusted to pH 11 by adding 2 N sodium hydroxide solution. Alternatively the salt can be dissolved in 12% aq. solution of potassium carbonate (150 mL). When the salt was completely dissolved the solution was extracted 4 times with dichloromethane (15 mL). The combined organic layers were washed with brine, dried over sodium sulfate and concentrated under reduced pressure obtaining 3.32 g (16.4 mmol, 33%) R-(-)-PZQamine as a colorless solid. m.p. 122-123°C. [α]D20 = -305° (c=1, DCM). 99% ee* (determined by polarimetry). Recovering of the diasteromeric salt. The combined mother liquors of the crystallization process were concentrated under reduced pressure until isopropanol was evaporated. The remaining suspension was dissolved by adding 2 N sodium hydroxid or 12% aq. solution of potassium carbonate until a pH 10-11 was reached. The solution was extracted 4 times with dichloromethane (15 mL). The combined organic layers were washed with brine, dried over sodium sulfate and concentrated under reduced pressure obtaining 5.34 g (26.4 mmol, 53%) enantioenriched S-(-)-PZQamine as a yellow solid. m.p. 102-104°C. [α]D20 = +170° (c=1, DCM). 56% ee* (determined by polarimetry). Recycling of the resolving agent. The combined basic aq. solutions were adjusted to pH 2-3 by adding 2 N aq. HCl immediately after the extraction of PZQamine. The resulting colorless precipitate was filtered off, washed with cold water and dried in vacuum to give 21.1 g (44.1 mmol, 89%) of (-)-dibenzoyl-L-tartaric acid as a colorless solid. For further purification the solid was recrystallized from acetone/hexane (1:2). Resolution of (S)-PZQamine with (-)-di-p-anisoyl-L-tartaric acid (see: Diastereomeric salt resolution of praziquanamine with (-)-di-p-anisoyl-L-tartaric acid obtainig S-(+)-PZQamine (MW47-3)) (rac)-PZQamine (505 mg, 2.50 mmol) and (-)-di-p-anisoyl-L-tartaric acid (1.07 g, 2.50 mmol) was dissolved in a mixture of isopropanol (10 mL) and water (2.0 mL) by heating. The solution was allowed to cool to room temperature and stand for 18 h. The precipitate was filtered off and dried obtaining 656 mg (43%) of the diastereomeric salt as a pale yellow solid. Liberated amine: [α]D20 = 260° (c = 1, DCM), 85% ee (determined by polarimetry) The salt (504 mg, 830 µmol) was recrystallized from a mixture of isopropanol (5.3 mL) and water (2.7 mL) and stored for 3 day in the fridge at 5°C to give 361 mg (831 mmol, 72%, 31% overall) of a colorless solid. Liberated amine: 101 mg (20%) (R)-PZQamine as a colorless solid [α]D20 = 274° (c = 1, DCM) -> 90% ee. Resolution of PZQamine with quinic acid (see: http://www.thesynapticleap.org/node/313) A solution of (rac)-PZQamine (202 mg, 1.00 mmol) in methanol (0.8 mL) was added to a warm solution of quinic acid (1.30 mmol, 250 mg) in methanol (4.2 mL), heated at reflux for 15 min and cooled to room temperature. The amorphous precipitate was filtered off and the filtrate was concentrated to about 1.5 mL when a solid started to precipitate. The mixture was stored in the fridge at 6°C for 10 h and then a second amorphous precipitate was collected. Both precipitates were suspended in water (5 mL) and adjusted to pH 12 by adding a 2 N NaOH solution. The solutions was extracted with DCM, dried over sodium sulfate and concentrated under reduced pressure. The liberation of the first precipitate obtained 119 mg (59%, 48% ee) (S)-PZQamine and the second precipitate gave 47 mg (23%, 85% ee) (R)-PZQamine as a pale yellow solids. Resolving agents which have been tested unsuccessfully: (see: http://www.thesynapticleap.org/node/305#comment-520) L-tartaric acid, (S)-(+)-mandelic acid, (1S)-(+)-camphor-10-sulfonic acid, (1R,3S)-(+)-camphoric acid, L-(-)-malic acid, (S)-(-)-BINOL in different solvents and solvent mixtures of water, methanol, ethanol, isopropanol, acetone, acetonitrile, ethyl acetate, DCM, diethyl ether, tertbutylmethyl ether, diisopropyl ether and toluene. Synthesis of enantiopure PZQ from enantiopure PZQamine (see: http://www.ourexperiment.org/racres_pzq/1468) To an ice-cooled solution of R-(-)-PZQamine (3.27 g, 16.2 mmol) and triethylamine (2.45 g, 3.38 mL, 24.3 mmol, 1.5 eq.) in dichloromethane (80 mL) was added dropwise cyclohexanoyl chloride (2.62 g, 2.39 mL, 17.8 mmol, 1.1 eq.) at 0°C and stirred for 14 h at room temperature. The solution was quenched with water (10 mL) and stirred for further 30 min. The layers were separated and the organic layer was washed with sodium carbonate solution, 0.5 N HCl solution and brine, dried over magnesium sulfate and concentrated under reduced pressure. The remaining yellow oil became solid after drying under high vacuum and storing in the fridge at 5°C. The pale yellow solid was recrystallized from acetone/hexane (35 mL, 1:1 mixture) and two further batches of analytically identical crystals were obtained from the mother liquor after concentration and recrystallization. R-(-)PZQ was obtained as colorless crystals (4.56 g, 14.6 mmol, 90%, 97%ee). m.p. 113.5 - 114.5°C. [α]D20 = -136° (c=1, EtOH). HPLC: Chiracel OD-H column, eluent: hexane/isopropanol/triethylamine 60:40:0.1, flow rate 0.7 mL per minute. RT: R-(-)-PZQ: 11.1 min, S-(-)-PZQ 13.6 min. We thank Denis Daumerie (WHO/TDR) for a generous gift of racemic praziquantel and Harald Sekljic (Intervet Innovation GmbH) for a gift of analytically pure samples of (R)- and (S)-PZQ. 1) Pyrazinoisoquinolines as Anthelmintic Agents, R. Pohlke, F. Loebich, J. Seubert, H. Thomas and P. Andrews, US Patent 3,993,760, 1976. (racemic resolution using quinic acid); German version: Pyrazinoisochinolin-Derivat, R. Polke, F. Loebich, J. Seubert, H. Thomas and P. Andrews, DE 2,331,713 German Patent 2,331,713, 1975. 3) 2-Acyl-4-Oxo-Pyrazino-isoquinoline Derivatives and Process for the Preparation Thereof, J. Seubert, H. Thomas, P. Andrews, US Patent 4,001,411, 1977 (German Patent 2,362,539, 1973) - this contains the partially-successful attempt to reduce the intermediate enamide asymmetrically with Raney Ni modified with tartaric acid. Other asymmetric syntheses: There have been two reports of enantioselective syntheses: 1. Total Synthesis of (-)-Praziquantel: an Anthelmintic Drug, C. Ma, Q.-F. Zhang, Y.-B. Tan and L. Wang, J. Chem. Res. 2004, 186-187 (DOI: 10.3184/0308234041640564); 2. Enantioselective Synthesis of (R)-(-)-Praziquantel (PZQ), P. Roszkowski, J. K. Maurin and Z. Czarnocki, Tetrahedron: Asymmetr. 2006, 17, 1415–1419 (DOI: 10.1016/j.tetasy.2006.04.023). 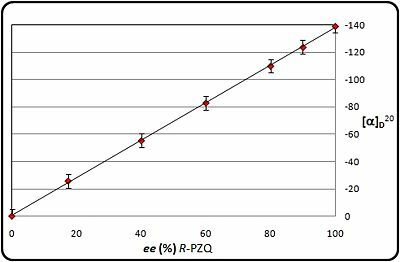 There is also a report of the chromatographic separation of PZQ enantiomers on a preparative (gram) scale using a cellulose triacetate support (Meyer 2009). Novel processes for the preparation or (R)-alpha-(2,3-dimethoxyphenyl)-1-[2-(4-fluorophenyl)ethyl]-4-piperidinemethanol, Daugs et al. US Patent Application 2002, US 2002/0151717(A1). This page was last edited on 21 September 2011, at 03:51.